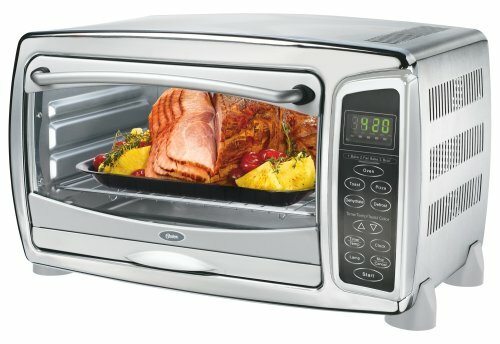 I think Oster 6058 is a balanced model with 6-slice large capacity and comes with convection technology. It is a versatile product which sets on your counter top and covers less space meanwhile providing you with multiple cooking choices from roasting, baking, toasting and even giving you the facility to dehydrate your food. With energy saving technology, Oster 6058 is a good to pick product for a family having more members. The actual measure of this model is 19″ wide, 12″ height, and 11″ depth (13″ including handle); oven interior: 14″ wide, 7 1/2″ height, and 11″ depth. Its adjustable temperature ranges from 150 to 450°C, with bake, broil, toast, pizza, and dehydrate functions. Its stainless steel, the chrome accent housing, which is a kind of high quality stainless steel material, gives a very classy look to the product. It has a 90 minutes timer which also works as a clock. Convection Technology – Oster 6058 uses Convection technology which enables this toaster oven to cook faster and it provides even cooking as compared to conventional toasters. Digital Controls – Digitally operated controls lets you choose cooking settings accurately. 3 Rack Positions with Removable Tray and Enamel Baking Pan – Multiple rack positions allow you to cook a variety of similar food at the same time. Removable tray allows setting food directly instead of placing utensils in the oven and is convenient to clean. The baking pan is an enamel baking pan which makes it durable. Interior Light – In built light in the oven’s baking/cooking section brings ease of viewing the food while being cooked. The easy monitoring enables you to avoid food from being burnt. What Do Owners Say About The Oster 6058? 90 Minutes Timer – The extensive 90 minutes timer allows baking and roasting of meals which need longer time to cook like meat, beef etc. Price – Being low at price, the oven is nicely made and has more functions and accessories than other ovens at the same price. Plus, its look of stainless steel is quite appealing too. Quality Issue – The biggest problem about this oven is its quality issue. Some owners that used this oven for years complained that this oven died or one of its functions stopped working after the end of warranty period. They said that it doesn’t last as long as other ovens or toasters. Capacity – It’s a controversial topic because some buyers think its capacity is large enough for big families and can be a good helper. It can even handle nearly 6 full English muffins at one time. However, some owner point out that although the oven has large capacity (can bake a 12 inches pizza) but can’t house a pizza pan of size 13 inches. This is what you should know when choosing accessories. Hot Exterior -This oven’s exterior, especially the glass door, gets really hot while operating so one needs to take care while touching it when using. If you have children in the house, make sure they keep distance from this oven. Being cheap and multifunctional, this oven is a good option for large families. Although the operation needs a little care, the cooking performance of this oven is quite appreciable due to convection technology being employed. If you don’t use toaster oven very frequently this is definitely an option for you.